After an hour at the microphone Monday morning, Sen. Bernie Sanders (I-Vt.) seemed suddenly to note the plight of his audience. 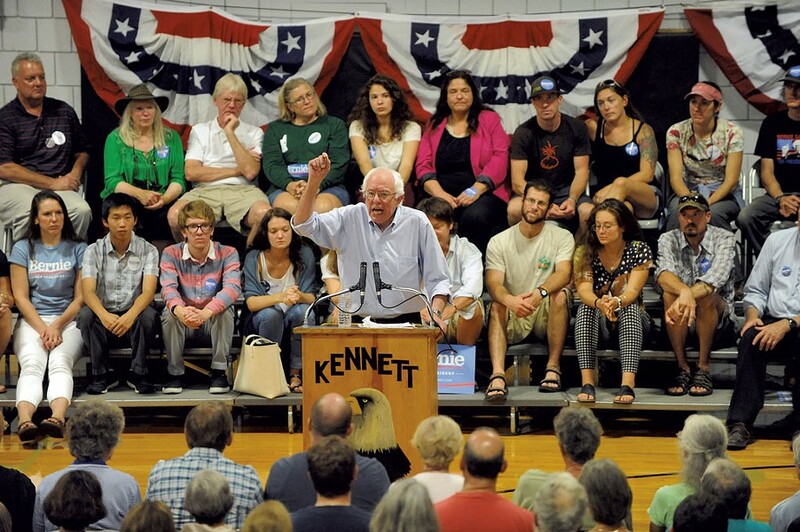 "You have been extraordinarily patient and kind in this hot gym, listening to me rant a while," he told several hundred sweating supporters, stuck to folding chairs and bleacher seats in a sweltering New Hampshire gymnasium. "We love it!" shouted a man near the back of the room, drawing a chorus of cheers. "All right," Sanders joked. "I'll go on for a few more hours." His voice was ragged from the rigors of a 10-day tour through Des Moines, Chicago, Reno, Charleston, S.C., and now Conway, N.H. But the 73-year-old presidential candidate appeared energized by the reception — and fully capable of carrying out his threat. "I know that three and a half, four months ago, people — media, pundits and all the professional politicians — were looking at this campaign," Sanders had begun an hour earlier, using both hands to draw air quotes at the mention of his establishment foes. "They said, 'Well, you know, Bernie's an interesting guy. He's a fringe candidate.'" The word "fringe" came out of his mouth long and slow, his voice dripping with disdain. "'Who really thinks, in America, that the people are prepared to stand up to the billionaire class?'" Sanders asked, imitating those who doubted him. Who really thinks Social Security should be expanded, Sanders continued, and the wealthiest forced to pay higher taxes? "Well, to everybody's surprise, it turns out that there are millions of people who do agree with that," he concluded. No doubt that is true. Last week, CNN released a national poll showing Sanders drawing support from 29 percent of the Democratic electorate — up 10 percentage points in less than a month. Since he joined the race three months ago, Sanders appears to have grown more comfortable with and practiced in his newfound role as a candidate for national office. "Now, one of the fun things of running for president is, you can try to force debate and discussion about issues that others would prefer to push under the carpet," he told his Conway audience, launching into a version of the stump speech he's been giving for decades. Many of the themes were familiar: Real unemployment is higher than the media will admit; Citizens United is ruining the country; climate change is ruining the planet. But after months on the campaign trail, Sanders' delivery has improved, and his applause lines now crackle with a new intensity. "It makes a lot more sense for us to be investing in jobs and education rather than jails and incarceration," he said, earning his first standing ovation of the day. "It's more expensive to put somebody in jail than to send them to the University of New Hampshire." The substance of Sanders' speeches has also evolved. Since Black Lives Matter protesters interrupted appearances in Las Vegas and Portland, Ore., the Vermont senator has incorporated into his remarks a new focus on racism and criminal justice reform. He now frequently names black Americans killed at the hands of white law-enforcement officials. And at most rallies, Symone Sanders, a 25-year-old black woman he hired two weeks ago to serve as his national press secretary, introduces him. But Symone Sanders was nowhere to be seen in the Kennett Middle School gymnasium, and the candidate breezed through his lines on racial injustice. This was a far whiter audience than he'd encountered just days earlier in Columbia, S.C., where he had met privately with black ministers and community leaders. Here, ice cream magnate Ben Cohen was treated like a celebrity when he introduced Sanders — and a bearded chef queried him about genetically modified organisms during a brief question-and-answer session. If Sanders is doing well in the national polls, he is doing especially well in states whose demographics mirror Vermont's. One recent survey conducted by Franklin Pierce University and the Boston Herald showed him leading Democratic rival Hillary Clinton 44 to 37 percent in New Hampshire, a statistical tie given the poll's margin of error. Sanders recently moved his Granite State campaign operation from a small office in Concord to a bigger one in Manchester. Within the next three weeks, according to state director Julia Barnes — a former executive director of the Vermont Democratic Party — the campaign will open five new field offices in New Hampshire and hire many more workers to join the 15 already active in the state. "It's a roller-coaster ride," Barnes said, as her staff stacked chairs and cleaned up the gym. "We are ramping up so quickly. The crowds are getting bigger. The volunteer enthusiasm is insane. It's like nothing I've ever experienced before." Of course, presidential races can turn on a dime. Outside the school building, in the shadow of the White Mountains, Sanders faced questions from some two dozen reporters, many of whom appeared entirely focused on the race's latest development: Vice President Joe Biden's flirtation with a run of his own. Prompted by a reporter, Sanders agreed that the Biden bubble seemed to be the result of Clinton's recent stumbles. She has faced questions about her exclusive use of a private email server as secretary of state — and her resistance to disclosing the contents of that server. "Well, I think the evidence is pretty clear," Sanders said. "We are gaining. I think what the polls seem to indicate is that Hillary Clinton's support seems to be receding a bit. But we've got a long way to go. Joe would be a formidable opponent." At a press conference last week, Clinton dismissed media scrutiny over her emails, telling reporters in Las Vegas, "Nobody cares about it other than you guys." But at least two New Hampshire residents who attended Sanders' speech do: Conway retirees Kate Schreiber and Linda Grucel. "I'm upset with Hillary — that she's not answering anything about her server. You have to tell the truth instead of just pushing it away," Grucel said. "I think it's definitely a problem." "It's all part of her character," Schreiber interjected. "And character bears weight on whether people are going to elect her or not." "And this man is much more approachable than Hillary," Grucel said of Sanders. "Hillary just has this façade around her, and this guy is real." Three hours later and a 45-minute drive north, the Vermont senator arrived at the White Mountain Chalet, a drab event space in Berlin, for another town hall meeting. Organizing the event was semi-retired lawyer Ted Bosen, who plans to open a field office for Sanders next week across the street from Berlin City Hall. He boasted that it would be "the northernmost office of any candidate in the race." Clinton's North Country outpost, he noted with pride, is one block south. Bosen said he believes Sanders would do well in the sparsely populated valley towns of Coos County. "Berlin is kind of the poster child of what Bernie's talking about," he explained. "This town knows what he's talking about. We lost a mill here that employed almost everybody, directly or indirectly." Thanks to free-trade agreements Sanders has long opposed, Bosen argued, the paper industry has moved abroad, robbing Berlin of its jobs and its young people. "This was once a very proud and really affluent area. And these people — they hold their head up, and they're very proud of their heritage. They're not complaining," Bosen said. "But they need the opportunity. They don't need a handout. They want an opportunity to make this city respectable again. They need good jobs, and they need a little relief. So Bernie speaks to that." When he took the podium that afternoon, Sanders did speak to that. He railed against "establishment politics," "establishment economics" and "establishment media," all of which he blamed for empowering the "billionaire class" at the expense of working Americans. "Whenever I say that, the media puts it in quotation marks: 'Sanders said "the billionaire class,"'" he said. "Guess what: There is a billionaire class! You don't need any quotations!" If Kennett Middle School was hot, the White Mountain Chalet was hotter. Fans blew humid air around the room, but the audience of a couple hundred looked uncomfortable as Sanders worked himself into a lather. Sweat dripping through his blue button-down shirt, the senator dabbed at his head and face with a handkerchief, but he did not let up. The wealthiest Americans manage to consolidate their wealth, Sanders argued, "because many of your Republican friends and neighbors simply do not know." Audience members murmured their approval. "When some greedy billionaire says, 'I want it all, give me tax breaks, cut Social Security, cut Medicare, I'm used to that," he said, his voice rising. "But I will never understand why working-class people in Vermont or New Hampshire continue to vote against their best interest!"